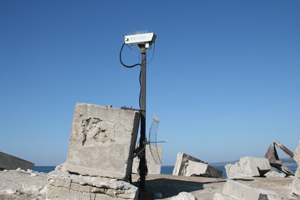 About 5 years ago we helped the California State Park at Ano Nuevo install a live 2 mega pixel wireless web camera on the elephant seal rookery island about 1/2 mile off the coast. The camera is a PTZ and was linked to the visitors center using a 5GHz link. At the visitor center, rangers could steer the camera and display the images of bulls fighting, cows giving birth, and pups playing on the beach all in HD to the visitors. The visitors center was linked to the outside world over a fairly unreliable T-1 (that is 1.544Mbps) and the camera used MJPEG, so the bandwidth was just not sufficient for good web browsing. The techs with the Parks were able to transcode the video down to QCIF and slow frame rate and get it on their web page here http://parks.ca.gov/?page_id=25732 . Everything was good until about 4 months ago when a pelican built its nest on top of our parabolic antenna. The nest pushed the antenna out of alignment and now the video is only available when the tide is in the perfect level where the signal reflects off the water at just the right angle. At some point the biologists will allow the techs to fix the antenna, once the pelican chicks are hatched. So about 9 months ago I was up at Piedras Blancas, just north of San Simeon, watching the elephant seals there, which I think put on a much more interesting show. You can get much closer to the animals and there seem to be many more of them. While I was there I had a conversation with one of the docents about installing a solar powered camera along the beach. After going back and fourth over design for several months and working through budgeting, the State was able to pull together a project to install the system. Last week that project was commissioned. The link runs from the beach about 1.5 miles up to the old lighthouse where there is a T-1. The system uses a pair of HauteSpot WRAPSTATION LX units and is completely solar powered. It is pretty remote, and the link is pretty slow, not because of the wireless, but because of the wire going up to the lighthouse. We thought about shooting a wireless link back from the lighthouse to Hearst Castle, but the broadband speed was not any better there than at the lighthouse. The only limit on what is possible is a closed mind. ISC West 2012 HauteSpot is GO!